Stainless steel case with a stainless steel bracelet. Fixed stainless steel bezel set with Swarovski crystals. Silver dial with skeleton hands and index hour markers. Arabic numeral marks the 12 o'clock position. Minute markers. Tachymeter around the outer rim. Dial Type: Analog. Luminescent hands. Date display at the 6 o'clock position. Chronograph - three sub-dials displaying: 60 second, 60 minute and 24 hour. Quartz movement. Scratch resistant mineral crystal. Solid case back. Case diameter: 41 mm. Case thickness: 13 mm. Round case shape. Fold over safety clasp. Water resistant at 100 meters / 330 feet. Functions: chronograph, tachymeter date, hour, minute, second. 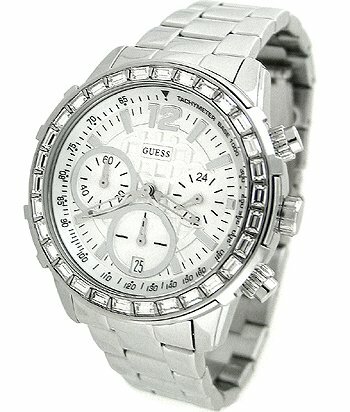 Guess Lady B Chronograph Crystal Bezel Ladies Watch SU0016L1.